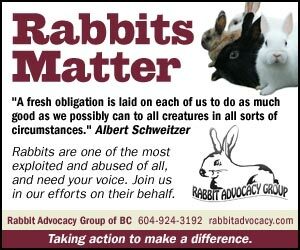 Rabbit Advocacy's online ad can be seen in The Province in the ‘Pets’ section under ‘Life’ running the entire month of October. We are taking action individually and as a united force, impelling social change. We have run the PSA again, December 11, 2009 - January 12, 2010.